Sacramento State graduate student Leisa Faulkner and sociology professor Paul Burke have been visiting Haiti to distribute food and medical supplies to residents of Cite Soleil and Port au Prince. Through their charitable organization, Children’s Hope, they’re also raising funds for an amputee clinic. More than 4,000 Haitians lost their limbs after the earthquake and only 120 have been fabricated. Madam Pun and her visiting American daughter are providing a home and a school to 20 orphans in her backyard in Cite Soleil, Haiti, while also picking up family-size bottles of hand sanitizer to distribute throughout the city. Pun is one of the many volunteers helping to distribute $240,000 worth of hand sanitizer donated to Children’s Hope, a Sacramento nonprofit organization. The supplies will be distributed next month to the living camps of Cite Soleil, where threats of cholera, malaria and exotic diseases are prevalent. Sacramento State sociology graduate student Leisa Faulkner founded Children’s Hope in 2004 to help the children and people of Haiti. Members of Children’s Hope regularly go to Haiti to do humanitarian work, Faulkner said. She and her team of volunteers take hand-carried donations to schools, clinics or prisons. Faulkner has made 13 trips to Haiti since 2004. She has brought other people into Children’s Hope, like sociology professor Paul Burke, who is the vice president of the organization. Burke, Faulkner and three other Sacramento community members recently returned from their weeklong trip to Port au Prince and Cite Soleil. While on their latest trip, they delivered medical supplies, raised funds for an amputee clinic project and finalized the details of an airlift drop that would deliver $250,000 worth of medical supplies. “We feel responsible to make all of the donation monies go as far as humanly possible. We buy wholesale pharmaceuticals, antibiotics and pain medications before we go,” Faulkner said. They visited hospitals and amputee clinics, such as the Lamp, Handicapped International and Helping Hands for Haiti, and a clinic in Mire Balais. The Lamp is the only free medical clinic in Cite Soleil. “Cite Soleil is (a) huge, notorious slum that is incredibly poor. Imagine if 500,000 people were homeless and living on the street - that’s Cite Soleil,” Burke said. 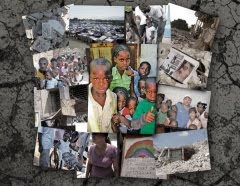 Residents of Cite Soleil rely heavily on donations because they cannot afford the necessary medical supplies to survive. A 3-year-old baby boy would have died of respiratory failure and high fever had it not been for the Tylenol drops donated by a Sacramento resident, Burke said. While delivering medical supplies to the Lamp, Burke and Faulkner met a mother with her baby boy wrapped in a towel and wearing a diaper made out of his sister’s bikini bottom. When Faulkner gave the baby a kiss, she said she noticed he was unnaturally hot. The doctor at the clinic said the baby was having respiratory failure and needed to be brought to the hospital for him to live, Burke and Faulkner said. “I asked him if infant Tylenol drops might help and he said we could try. I dug into the medical supply box we had just dropped off, found the drops and gave them to the baby,” Faulkner said. In addition to delivering medical supplies, Burke and Faulkner started setting up an amputee clinic in Cite Soleil. They brought in Jim Thweatt, a physical therapist from West Sacramento, who’s also an amputee. An estimated 4,000 to 6,000 Haitians lost limbs after the earthquake because of falling debris and gangrene-related infection. Artificial legs are the most commonly requested artificial limbs, and doctors are still expecting to discover more amputee cases, according to a Miami Herald report. Burke and Faulkner said they spoke with many Haitian doctors and physical therapists and discovered that only 120 new limbs have been fabricated since the earthquake. After seeing the need for an amputee clinic firsthand, Thweatt and Children’s Hope started to raise funds to set up the clinic, where Thweatt can see amputee patients and provide physical therapy. Besides working on their projects, Burke and Faulkner also deliver food to shelters in Cite Soleil. While food and medical supplies are the common needs, there are some who asked for money to invest, Burke and Faulkner said. One example is a women’s group in Morne Lazarre, Haiti. Burke and Faulkner visited Rea Dol, head of the women’s group and a “mother figure” in Morne Lazarre, to give food to the group. Dol, however, asked for microloans, which are small loans given to entrepreneurs in poor countries to start their own business. Once successful, they pay back the loan and can borrow more. Burke and Faulkner said they took the money they were planning to spend for food donations and financed eight microloans for $50 each. Burke and Faulkner are already preparing for their next trip in July and are collecting medical supplies and donations. They hope the Sac State community will get involved with Children’s Hope, Burke said. Burke and Faulkner are also seeking interns to fly down to Haiti with Children’s Hope for a month. Students must be able to carry two 50-pound duffel bags filled with medical supplies, Burke said. This is Hannah Bevills, I am the editor for Hospital.com. We are a medical publication whose focus is geared towards promoting awareness on hospitals, including information, news, and reviews on them. We are in the process of adding a medical supplies/equipments section offering an extensive list of information related to medical equipments. We would like to have our site included within your blog and offer our information to your readers, of course we would be more than happy to list your blog within our directory as well.